NZDCHF could be in for a reversal from its climb as it forms a double top on its daily time frame. Price has a long way to go before testing the neckline at the .6550 minor psychological level and breaking below it to confirm that a downtrend is in the works. The 100 SMA is still above the longer-term 200 SMA to indicate that the path of least resistance is to the upside. In other words, there’s still a chance for the climb to resume. The 100 SMA is holding as dynamic support at the moment and the 200 SMA is just close by to add another floor. 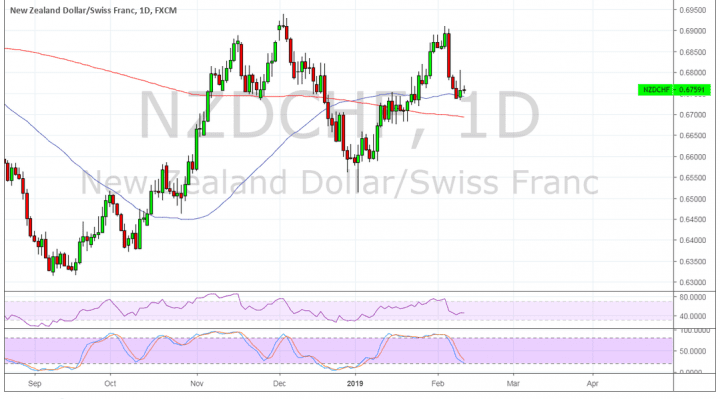 A break below the neckline could confirm that sellers are taking over, possibly dragging NZDCHF down by around 350 pips or the same height as the chart pattern. RSI is on the move down to show that bearish momentum is in play, but the oscillator might be changing its mind halfway through. Stochastic is also heading lower so price might follow suit, but buyers could return as the oscillator approaches oversold levels. This would reflect exhaustion among sellers and turning higher could confirm a return in bullish pressure. The RBNZ decision this week could determine where this pair might be headed next. Its neighbor, the RBA, already showed some dovish feathers as they signaled openness to cut rates again. Much of the dovishness is being pinned on trade tensions as this is weighing on demand for commodities. High-level talks are slated to take place this week and further tensions could lead to a grim outlook by the RBNZ and also weigh on risk-taking. In turn, this tends to favor the lower-yielding franc which is acting as a safe-haven while traders remain hesitant to buy up the dollar. Still, one factor to be mindful of is the flash crash earlier this week, which could keep traders cautious of buying the franc.